But 8 US Code Section 1405 does not confer US Nationality. It only confers US citizenship so the definition of a US National does not in any way shape or form define someone born a US Citizen solely by virtue 8 US Code Section 1405. It doesn't say anything about U.S. Nationality because it doesn't have to. 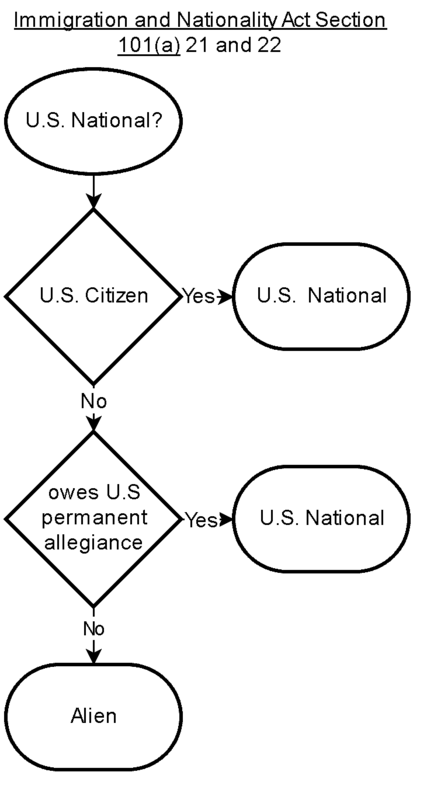 Anyone who is a U.S. Citizen is a U.S. National, because a U.S. National is any U.S. Citizen. Funny how you have nothing with any legal weight to back up that assertion. I couldn’t find anything either and that flowchart doesn’t meet my standards. My opinion is that every US citizen at birth should also be a US national at birth. But, like you, I’ve yet to find an applicable legal definition for ‘citizen of the US’ other than what is described in the 14th Amendment and nationality isn’t mentioned. My opinion is that every US citizen at birth should also be a US national at birth. Not all citizens are people. Some are corporations. A corporation is also deemed to be a citizen for certain purposes. It is a citizen of the United States and of the state under whose laws it was organized. A particular state, commonly Delaware, is selected for incorporation because that state charges lower taxes and its laws favor businesses. Once the company incorporates in the designated state, it is a citizen of that state, but it can apply in any other state for authority to do business there. And they can have nationality, too. "The term "national of the United States" means (A) a citizen of the United States, or (B) a person who, though not a citizen of the United States, owes permanent allegiance to the United States." Start: Who is a U.S. National? That flowchart is illustrating the law it mentions in the chart, and the law has legal weight. Your opinion about a U.S. Citizen also being a U.S. National is in line with reality, because that's what it already is. It is NOT "Time to move on". Obama ,who has been under formal citizens arrest since 2012, is an imposter,fraud,traitor and spy. See: "There is NO 'President' Obama" www.thepostemail.com... Also see: "Imposters in the Oval Office" by me. (IUniverse Publishing). www.thepostemail.com... Obama should be hanged or shot by a military firing squad, if convicted. When a U.S. Corporation is "nationalized", it is taken over by the U.S. government. A U.S. National is not. The U.S. assumption of a controlling interest in General Motors Corp. isn't the first time the government has nationalized a company or an industry. It has taken shares in banks, railways, steel mills, coal mines and foreclosed homes. Most nationalizations were during wartime. But the current financial crisis has generated more than a few. Last year, the government took effective control of mortgage giants Fannie Mae and Freddie Mac. It stopped short of nationalizing insurance giant American International Group, but forced a major restructuring and leadership change with a $180 billion taxpayer bailout.